speeding | Missing the point? What does god mean by being “chosen “? but sadly when I do see any attempts to classify all Pentecostals as non Christians, heretics, I know the user themselves clearly do not know or read the Bible for a start. I now live all the way in the Quebec but lately I have often seen searches done on my site about what can a person do about bad cops and their false speeding, revenue generating tickets in Edmonton, and in Alberta.. what?? write to the politicians and news editors firstly, tell them why it is perverse for decades now in Alberta this has been a false police empire build scheme, police job preservation program..
15 YEARS IN ALBERTA AND I GOT LOADS OF CALGARY SPEEDING TICKETS, 3 IN A ROW FROM THE SAME COP, TWICE IN CANMORE ON THE SAME SPOT TOO, AND NEXT 15 YEARS IN QUEBEC I GOT NO TICKETS AT ALL. Why the difference?.. politcal bosses are different. Conservative vs Liberal. More crap from the Alberta Police too.. Since January 2O08, RCMP and provincial sheriffs have issued more than 2,000 speeding tickets to people driving on Highway 63, including 363 tickets over the weekend. Political and labour leaders have been lobbying the Alberta government for years to twin the highway between Edmonton and the Fort McMurray area. While some work is underway, most of the money is being spent on highway work north of the oilsands capital. Bellows said the entire highway would be safe if motorists just obeyed the speed limit. “We are frustrated,” he said. “Just slow down and relax. 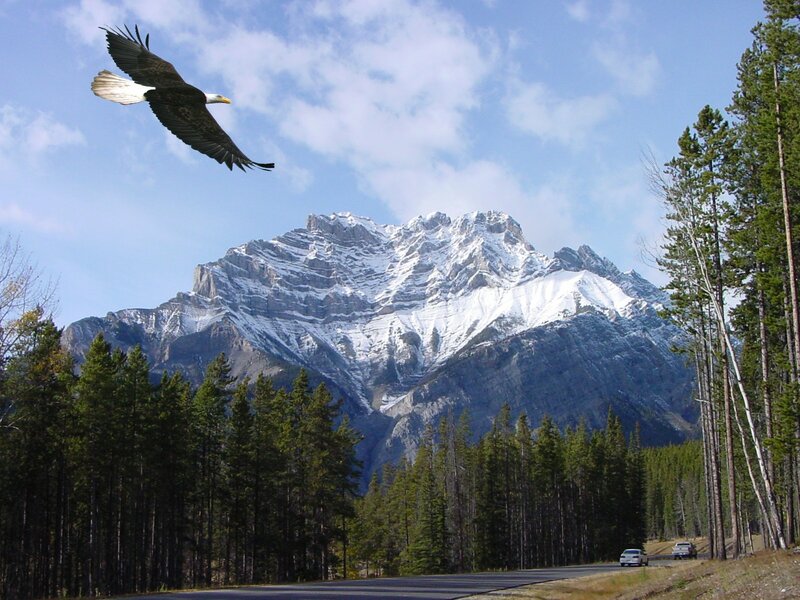 You will get there safe.” Meanwhile, leadfoot drivers are also a problem on highways through Banff National Park. RCMP report that officers issued 115 speeding tickets over the weekend between Lake Louise and the Jasper National Park Boundary. In some cases drivers along Highway 93 were clocked going more than 60 km over the posted speed limit. ( Revenue generating ) Speed limits in the mountain parks are set with an eye toward preventing collisions with wildlife. ( and how often does that occur?) RCMP in the Peace River area said even when police warn motorists about speed traps some drivers continue to drive faster than the posted limit. ..
RCMP like to give speed tickets when you are leaving the park, not entering it too.. and I got 2 speeding tickets on the same spot in Canmore ten years apart too… and the second time I went to court and rightfully fought the dirty RCMP too. In reality the too often self serving, money hungry, promotional and empire oriented police, and their superiors, bad justice ministers, bad politicians really do not care about the citizens good welfare but only their own..
UK ” official statistics showed that only five per cent of crashes are caused by drivers breaking the speed limit. Drivers who let their attention wander cause more than six times as many accidents.” Driver error accounted for 66 per cent of accidents.. and add the road rage, impaired, drunk drivers, bad poorly maintained vehicles to that too .. Most reasonable and reasoning people have seen the folly of speed cameras for decades now too. Conservative controlled Swindon Council has decided that it will no longer make it’s contribution towards the cost of speed cameras in Wiltshire, preferring instead to plough it’s £400,000 into real road safety measures.An Australian study estimates that about half of all traffic accidents in Australia may be due to road rage and most of the others related to alcohol, impaired driving and yet the police falsely tend to pursue revenue generating speeding traffic tickets still and why? “Isn’t it better to have a road that is designed to be safe from the start, rather than sticking a camera there to catch people who may or may not be driving dangerously? We treat road safety very, very seriously but we pay about £400,000 a year to the road safety partnership – money which goes straight into the Government’s pockets. Almost half of motorists do not think speed cameras improve road safety according to new survey results from whatcar.com. For fatal accidents the most frequently reported contributory factor was loss of control, which was involved in 35 per cent of road deaths. Failure to look properly was the most frequently reported contributory factor and was involved in 32 per cent of all injury accidents. Five of the six most frequently reported contributory factors were some kind of driver or rider error or reaction. How many cops in Alberta are arrested annually for drunk driving coming home after work from being at the Police Tavern too. A study of the figures in the British Medical Journal showed a gap between police and hospital data showed a wide divergence in these figures said one of the authors of the article, Mike Gill, professor of public health at Surrey University. The Police are known to lie, and they try to please their political bosses , to get a raise by generating revenue from traffic tickets. The survey of the Canadian vital statistics database, made up of information from death certificates, shows that 97,964 people were killed in motor vehicle accidents during the past quarter-century. However, the annual number of deaths dropped 52 per cent to 2,875 in 2004 from 5,933 in 1979. Nearly three-quarters of those killed in these accidents were male, and motorists at either end of the age spectrum had higher-than-average death rates. Pedestrians accounted for 12 per cent of motor vehicle deaths, followed by motorcyclists and drivers of all-terrain and other off-road vehicles. Elderly pedestrians were also found to be more than three times likelier than the general population to be killed in motor vehicle accidents. The study does not explain why. Rural roads proved particularly treacherous for drivers. Sixty-two per cent of fatal collisions in 2004 took place in rural areas. Yukon had the highest death rate at 16.4 deaths per 100,000 people. Newfoundland and Labrador and Ontario were the only two provinces and territories reporting a death rate lower than the national average of nine for every 100,000 people. The study notes that while death rates have fallen, the ubiquitous use of cell phones and BlackBerrys while driving pose a danger to drivers. Road rage is a relatively serious act; it can be seen as a violation of human and property rights , an endangerment of other’s personal well being, security. Road rage is easy to convict, merely get a video camera and record the driving.. a video camera have been used successfuly on bad cops, like the RCMP. Note this important brief introduction to road safety .. Yes you always do have to drive safely, in control, not impaired as well and yes there are many, many different factors that now can cause a vehicular, automotive accident, including but not limited to the actual daily road conditions, even the type of tires you have .. for it is a fact that good tires lead to a safer drive, and so does a 4 wheel drive. Next when you start to first drive at any day do first immediately test the road condition by coming to a planned sudden stop , and see firsthand how your car reacts accordingly.. then next do use this experience to set how you will drive the rest of the day too. And no matter what car, or tires you have, or who is the driver, if you do hit a patch of black ice, due clearly to the failure of others, such as the Governments, municipalities, to apply salt and gravel on the icy / snowy road, to falsely try to save money here, it can be very, very hazardous now too. Give them a fine, ticket, they firstly do deserve it too. Now hypothetical if you do not drive at all you are less likely to have an accident, assuming another driver does not hit you while walking..
CBC.ca – Alberta has been particularly hard-hit by recession-fed job losses, with young people and unemployed men claiming federal Employment Insurance benefits in near record numbers, Statistics Canada said Tuesday. Some Ostrich cop lovers like to remain in the dark as to how bad the cops now really are too.. well many more see the truth about the cops..
Too many COPS, persons distort the LAW. it’s meaning still too. Unacceptable. The specific Laws are created for a reason and given a certain set of conditions and circumstances. When the circumstances or situation are not present then the law is basically not applicable. (2 Cor 3:6 KJV) for the letter killeth, but the spirit giveth life. These cop lovers must have been living in the dark ages still too even in Alberta? while thousands of persons do demand the rightful dismantling of the RCMP even.. look here here is what the news media says about the RCMP today.. No one can deny the many bad experiences people do have with the RCMP, Alberta cops.. I too now have dozens of posts about the bad RCMP read often by others too.. I have been rightfully helping the federal and provincial legislators to cut the bad police budgets for decades now too. Surrey 6 allegation lowers RCMP morale CBC.ca RCMP in Metro Vancouver acknowledge staff morale has suffered following the revelation a senior investigator on the notorious Surrey Six homicide investigation is himself under investigation.The officer, a member of the regional homicide investigation team, was assigned to desk duty after an allegation came to light in December that he was carrying on an inappropriate relationship with a potential witness in the case.- The RCMP have been under fire in BC in recent years after incidents involving the use of stun guns, deaths in custody, and drinking and driving. What should not come as a surprise to anyone in Canada is how many of the cops still do drink and drive drunk next still.. RCMP included, and why so many cops do not prosecute any other drunk drivers even all year.. and what else in the unacceptable perversties? “Approximately 85 % of traffic fatalities in South Africa can be attributed to transgressions of the law. This includes drunk driving, drunk pedestrians on the road, illegal and unsafe overtaking, overloading, speeding, etc. It is also undeniable as well that the people driving and using the cell phone are part of bad drivers now too. Most car and truck accidents are caused by road rage, or really bad drivers, and/or alcoholics, bad drug users and not by the driving speed still, but the police like to collect mostly revenue generating speeding, traffic tickets still! Why? Too many COPS, persons distort the LAW. it’s meaning still too. HEY I ONCE HAD WRITTEN A LONG TIME AGO THAT THE TOO OFTEN SELF CENTERED, PROUD PEOPLE OF ALBERTA DO REALLY NEED TO STOP BASHING THE POOR PEOPLE, AND THOSE ON SOCIAL AID, FOR A DAY WILL COME THAT THEY TOO WILL BE NEEDING SOCIAL AID AND THAT DAY HAS COME..
Now in Canada even I am very used to people the much too many Bullies who try to falsely dominate you, and these bullies go overboard in their reactions when you expose the truth about them and others especially when their pet idols, or careers are threatened. Me I am still rightfully actively resistant to all of the abusers, bullies, liars, even to the Church, GOVERNMENTAL, CORPORATE, POLICE oppressions still too. Speaking of free speech… Now Speed-related highway fatalities are down some 42 per cent in Ontario supposedly this year, and much of that has to do with the new laws enacted last spring, Ontario Provincial Police commissioner Julian Fantino said. But since speeding causes apparently less than 15 percent of the overall accidents, and bad cars, bad vehicles, road rage, drunk drivers, impaired drivers, talking on the phone causes the majority of the accidents still so how much did the police help now to reduce these more important statistics? Nothing again? and why not? and why is it too often unacceptably the bad cops are never found guilty as well? In regard also to the The Quebec bill to amend the Highway Safety Code and the Regulation respecting demerit points whicj was adopted on December 19, 2007. The rules and measures adopted mainly concern drinking and driving, speeding, photo radars and red-light cameras, driving courses, the use of cell phones while driving, and over-speed governors for certain heavy vehicles. This legislation introduces more severe penalties for repeat offenders of impaired driving and excessive speeding. It allows for the implementation of a photo radar and red-light camera pilot project providing for three photo radar locations and the installation of red-light cameras at two intersections in each of the three pilot regions. These fifteen locations will be announced at a later date. The law also provides for the institution of mandatory driving courses for new drivers and imposes probationary driver’s licenses on all new drivers, including new drivers of 25+ years of age, as well as gradual access to demerit points for new drivers under 25. A driving course will also be mandatory for mopeds. it will henceforth be forbidden for drivers to use a hand-held cell phone while driving but the person can still do text messaging, and what an contradictory absurdity too.. The activation of over-speed governors is now mandatory for certain heavy vehicles, and the maximum speed for these vehicles must be set at 105 km/h. The law also provides for the obligation to equip vehicles with winter tires from November 15 to April 1, greater latitude for municipalities that regulate speed limits on their territory and the possibility to carry out pilot projects, in particular for new types of vehicles. New road safety measures come into force in Québec on April 1, 2008: The use of hand-held cell phones will be banned from then on .Tougher penalties will be imposed on drivers guilty of excessive speeding Some of the motives for the false, partial restive applications, implantation of these laws can certainly now still be questioned as well. Some of the motives for the false, partial restive applications, implantation of these laws can certainly now still be questioned as well. The oppressive police enforcement of revenue generating speeding tickets enforcement is still basically economically beneficially hopefully to a very small, isolated segment of society, the related cops, judges, lawyers, and it is false job security approach for them even in Alberta. While the government of Alberta fails to often still to deal with the still much too many bad managers, bad civil and public servants abusing tax payers money, even stealing, not doing their jobs properly, unnecessarily taking out of town trips and charging it to the job still, Alberta today is putting 15 new sheriffs on the road in Alberta. Alberta for decades, and the police has been falsely preoccupied with putting every person in jail in Calgary, and Edmonton, all of Alberta for speeding, it seems and was another main reasons they spent so much money on building new court facilities in Alberta too… this is even all being done while statistics, experiences confirms that speeding does not kill, or cause the majority of accidents, but only drunk or drug impaired drivers, bad drivers, and road rage cause the majority of the accidents the government still wants to purse now mostly the speeders more aggressively in Alberta. Speaking about perverse law enforcement, whether it applies to the transit cops, or the RCMP, other cops too, the OLD wording ‘non-compliant’ no longer applies, in response to concerns raised by the public. The NEW use-of-Taser usage criteria is ‘actively resistant’, and the too often aggressive executive managers of the police enforcement, or the dictatorial ISP, internet service providers , it now seems that are all going crazy trying so hard to earn more money by means of a hopeful personal promotion too. And so they see anyone who is a threat to their survival, potential promotion is a serious persons to be next shot, killed or tasered, removed? Are also next Bell Sympatico’s executive care Sasha Rollins or the Conservative Prime Minister of Canada Stephen Harper now himself, others next going to taser me because ‘Me I am rightfully ‘actively resistant’ to the Church, GOVERNMENTAL or corporate, police oppressions still too? ? Even because I too am rightfully still not compliant to carrying out their too often despotic, invalid orders, so I am rightfully non submissive to their too much too many false demands, too? Bell Sympatico is getting carried away with their much too many, unenforceable, exotic, extreme, man made rules now, but they breached my contract still much to often and that itself is really inacceptable still too. Clearly Bell and their executive power has falsely now gone to their heads when they even do think they can abuse any others, an ordinary citizen now too. I as a Sympatico customer that does have a contract with Bell, a mutual contract they Bell now also have to respect and that contract now does not make me their slave, subordinate, and them my master, but they are still my legal equals in the matters. They have to respect my contract side now too. Do remind them all of that too at Bell. What you had never encountered crooked cops, crooked pastors, crooked lawyers, crooked managers, bad executives, lying no good politicians too? These same persons who too readily judge others, and who demand, want to enforce the rules upon the others, they cannot see the truth as to who they are firstly, they themselves are now the lying hypocrites. Even the Insurance companies do love excessive rules, and next have people break them so that way they can make more money next too. Seems you cannot trust anyone, any group, and yes they all have to regulated, reviewed, and that is why too many OF THE BAD PERSONS THERE they seem not to love our free speech and try falsely to oppress it. When most a person tries to enforce any rule upon me I immediate rightfully do next often do ask them who they think they are that they think I now have to respect the man made rules firstly? What makes them think I have to be now their false slave too? And why do they think I am their false slave and that they are any kind of boss over me in these matters? Here’s great example of bullying Hypocrisy now too. CALGARY – An employee with the Calgary Police Service has been arrested in a drug trafficking operation and a Calgary Policeman was arrested for drunk driving that caused an accident..
Another great example was big brother Bell Sympatico originally done in secret capping of the internet downloads which as you still can read about in full too in many places on the net was apparently caused by their very questionable motives, even a distorted, false excuse to charge more money to customers, a greedy attempt to make internet users buy and download rather Bell movies, an attempt to put Bell’s sub ISPs out of business, and much more.. so Bell Sympatico rightfully is now even facing a class action lawsuit in this regard too… and bad negative publicity, exposure too. Law and order enforcement starts firstly in the leaders own life. Exemplary Public exposure and prosecution of these real bad guys serves as a best deterrent to all too. Free speech and whistle blowers hell to make this happen too and bad guys wrongfully do not like this.. to bad for the bad guys.. and doing nothing about bad guys helps to makes it all worse.. so do something, write to the news editors, elected officials now too even if the bad guys do not like this. I am not only transparently honest, straight forward, and rightfully too, but I rightfully do still judge any of our leaders. civil and public servants, PROFESSIONALS. managers, executives too NOW not only per their past words, promises, acts, but also by a higher exemplary standard, BEHAVIOR now as well especially when they profess to be Christians, or rather as often in reality so called “Christian alcoholics”, or hypocrites .. which is rather an UNACCEPTABLE oxymoron. If you took 2 martinis or 2 beers a day you are an alcoholic. Alcoholism is a crime and not a disease, it is a crime, it is just as lethal, bad, and it is really unacceptable as selling or taking bad drugs too. Canada’s bad drug problem, drunk driving, alcoholism is increasing not just amongst the teens, but also in the work place, in the government now as well even amongst the civil and public servants. Most major home violence, car or truck accidents are still associated with alcohol now too and not speeding. It’s a fact that drinking alcohol can seriously damage one’s health and cause permanent brain damage as well .Alcohol may lead to liver problems, a variety of cancers as well as forms of osteoporosis and depression, and studies are showing, too, that women are more susceptible to the ill effects of alcohol than are men. We know that being an alcoholic is a terrible sin that now damages the person’s brain, affects their ability to work, to drive a car, and negatively affects their own behavior and affects many others too. The same reality is true of one taking now bad drugs as well.